Democratic presidential candidate Bernie Sanders descended upon Lordstown, Ohio yesterday to host a town hall meeting with town residents. Front and center was General Motors and its decision to indefinitely idle the GM Lordstown factory. Sanders said that, if elected president, he would bar companies like General Motors that would opt to shut down U.S. factories from obtaining federal contracts. He’d also freeze current contracts. “If entities like General Motors think that they can throw workers out on the street while they’re making billions of profit, and then move to Mexico and pay starvation wages and then line up for federal contracts, they’ve got another thing coming,” Sanders said during the campaign stop. Lordstown has become a political flashpoint in recent months after GM proposed to indefinitely idle the factory last November as part of a restructuring effort. While many of the plant’s employees have transferred to positions at other GM factories, the loss of the plant could devastate the local economy, which is estimated to lose $3 billion this year alone. U.S. President Donald Trump has excoriated General Motors and CEO Mary Barra over the automaker’s decision to idle the factory. Chevrolet Cruze production ended in early March; the Cruze was the plant’s only product. While some parts production is ongoing and could last until June, the future of the factory remains uncertain until GM begins negotiations with the United Automobile Workers union in September. The history of the Lordstown factory is storied and complex all the same. Production began in 1966 with the Chevrolet Impala. Since then, the facility has produced a host of small GM vehicles. In 2010, GM announced the Chevrolet Cruze, with it replacing the production of the Chevrolet Cobalt at Lordstown. At one point, the factory employed 4,700 people across three shifts. It’s believed that two factors – slowing sales and consumers flocking to crossovers and SUVs, rather than sedans – contributed to GM’s decision to slowly begin eliminating shifts at the plant. But it should be noted that competitors, especially Japan’s Toyota, Honda, Nissan, and Mazda, as well as Korea’s Hyundai and Kia, along with Volkswagen, are continuing to sell cars in the segment that the Chevy Cruze competed in prior to its discontinuation. 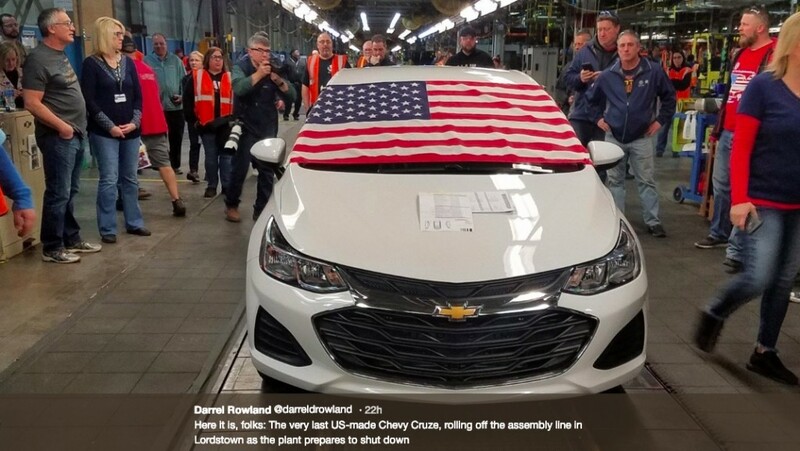 Subscribe to GM Authority for more Chevrolet Cruze news, GM Lordstown factory news, and around-the-clock GM news coverage. Bernie did not make much of an impression in Lordstown. The event was at the high school and not that many attended. Talk radio in the area mostly talked of how long he has been in office yet has done nothing to help them before in the economically depressed area. Even candidate Tim Ryan who held a rally had more people than Bernie. Even he is being questioned as to why he has done little to help Lordstown till he started to run for President. The UAW is waiting for this summer. They know they will either make a deal to keep a Lordstown open or they will leverage a deal for work else where. They are not stupid and know that the Cruze was an unexpected change and that the future was not for long even if it stayed in production. This is why you have not seen the same activity there as you saw in Canada. Bernie can stop buying but that will only result in more layoffs and less tax money for his crazy ideas. I’d say that it’s backwards thinking, but he knows exactly what he’s doing. Right out of the fifth column handbook. Force out all the businesses, make more and more people dependent on the government, control all aspects of their life, destroy the nation. 1. Deny GM of any federal contracts as retaliation for closing Lordstown. 2. GM lays off more UAW because of the loss of government contracts. This guy makes Trump look like he as PhD in Economics from Harvard. I agree, his frustration of the situation at Lordstown probably did not make him think more thoroughly of the long term “Domino Effect” it woukd have nationwide. I knew that Bernie sold out when he sold his soul right on the devil (killary aka Hillary). Dufus believes that denying federal government contracts will cause GM to re-open the lordstown plant and stop globalization. Newsflash: most sales for GM are now outside the US, so it doesn’t matter if you deny any contracts. Maybe they can award Toyota contracts. Bernie is joke, he didn’t get a job until 40. I believe its only been in government so he know nothing about business. He wrote a book to make money. Umm that’s not really working to make money. He just like many on the left want total control over you. He does have some good things to say such as SS and Medicare is the people money. but that’s about it. But the funny part about SS is his party the democrats are the one’s who raided in the 90’s to use at their own and now have to pay it back which is a large part of the deficit. Bernie could argue that Lordstown would still be producing small cars if Trump hadn’t announced misguided plans to rollback fuel economy standards, but this particular statement sounds like empty rhetoric to me. I believe there are ways to accomplish the same thing, if not bring jobs to the US; for instance, requiring government vehicles be built in the US, or with a certain percentage of domestic content. I know things like trucks are a sensitive topic for many, but if Toyota can make a truck with a North American parts content that’s 40% higher than the domestics, build their truck in the US, offer it at a competitive price, and it meets the requirements it’s being purchased for, then by all means Toyota deserves the sale. GM and Ford could do it just like Toyota if they weren’t strangled by the UAW rules. In order to offset cost to build you have to source parts from cheaper sources. However it starting to look like the US maybe a cheaper source which will be great for our country going forward. Toyota truck plant was given railroad spur, land and infra structure to come to Texas. Corporate welfare and concessions are the Toyota way. New plant, lower labor and benefits “Oh what a feeeeeling. ” The playing field is not so even as the public perceives. It is much more fun to slam GM than know all the facts. Flake news and perception make our country just want to support those whom pray on us. GM sells.more cars in China and other countries than it does here so I’m sure theyvare not worried about Bernie’s rants.